Learn about all of the available weapons and maps that will be featured in the upcoming Splatfest demo. The first Splatfest demonstration for Splatoon 2 is kicking off tomorrow, promising Nintendo Switch players a rare opportunity to check out the game ahead of its release date next Friday. The whole game won't be unlocked during the demonstration, but Switch players will be able to scope out an assortment of weapons and arenas within the Splatfest's four-hour window. Keep reading to discover all of the Splatoon 2 Splatfest's available maps and weapons. Nintendo's upcoming Splatfest demo is set to kick off with four available maps that players can check out within specific time frames. 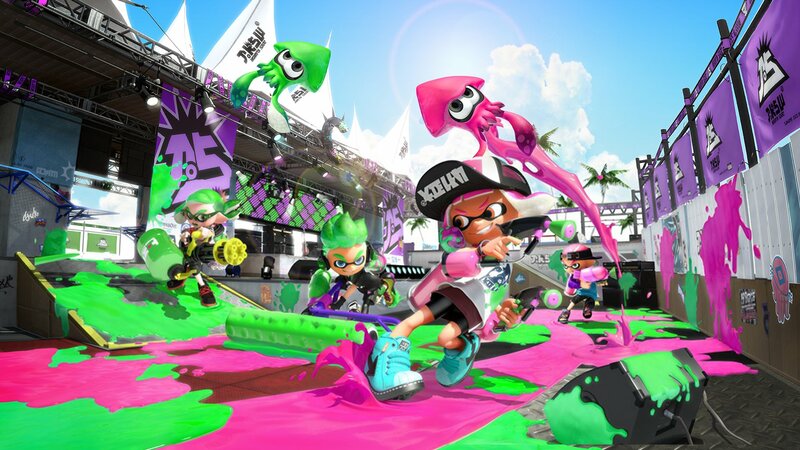 Between the hours of 6 and 8 p.m. EST, burgeoning ink-slingers will be able to play on the Starfish Mainstage and Inkblot Art Academy arenas. After that, between the hours of 8 and 10 p.m. EST, players can get their first romp around the Moray Towers and Humpback Pump Track arenas. Players participating in the upcoming Splatfest will also be able to make use of four distinct weapon sets. The first will include the Tentatek Splattershot primary weapon, with the Splat Bomb as a sub-weapon and the Inkjet in the special slot. The second set will include the ever-popular Splat Roller primary weapon alongside the Curling Bomb and Splashdown special weapon. The third set will include the Splat Charger, with the Splat Bomb as a secondary at the Sting Ray as a special option. Lastly, the fourth set will include the Splat Dualies alongside the Burst Bomb and Tenta Missiles special weapon. No doubt many players will be exciting to check out the Splatfest, but all those who miss out on the demonstration won't have to wait long to get their hands on the game, as Splatoon 2 is set to make its formal release on Friday, July 21. Splatoon 2 is sure to be the latest and greatest title to land on the Nintendo Switch, and will very likely rise the ranks and land on our list of the Best Nintendo Switch Games.